I love Indian Fusion cooking. Giving modern twist to a classic Indian dish and taking it to the next level is always exciting though experimental. 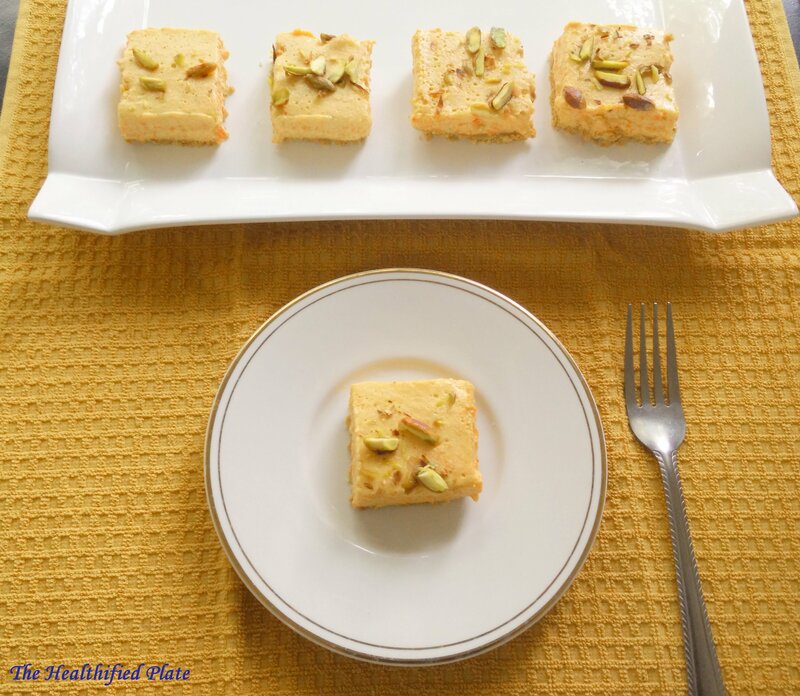 We Indians have a sweet tooth and no celebration small or big is complete without a dessert. 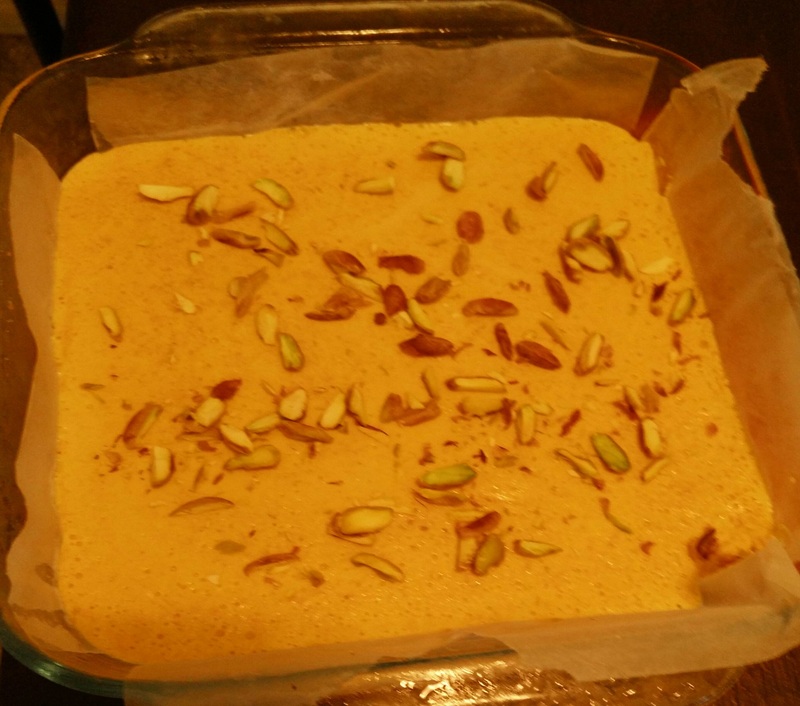 This Carrot Halwa Cheesecake is perfect fusion dessert for any celebration or party. 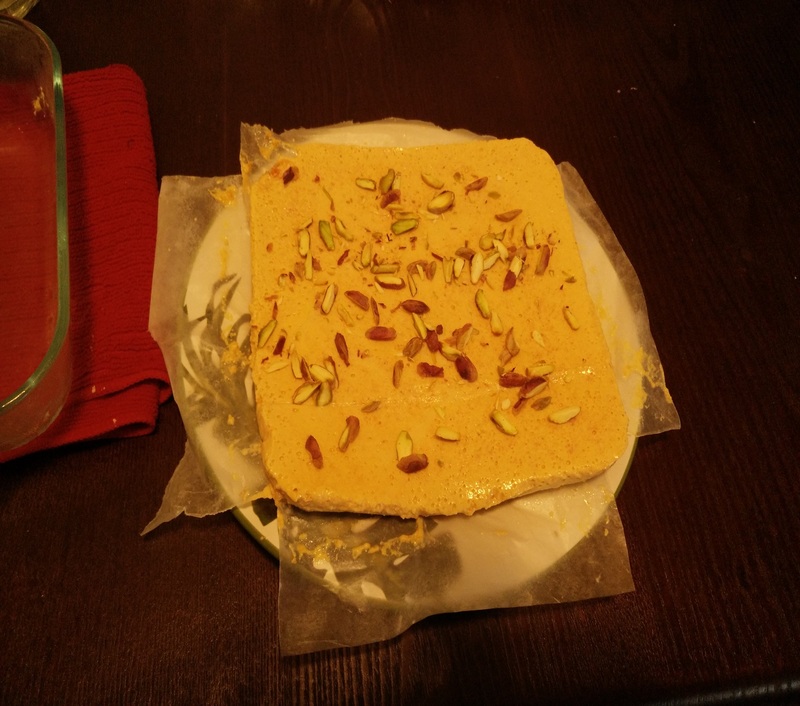 One bite into this is a explosion of many flavors and textures in mouth with sweetness of carrot halwa, creaminess of cheese, crumbliness of crust, and flavors of green cardamoms and rose water. This is definitely going to be a show stopper for any party or festival feasts. I adapted this recipe from here. There are so many interesting things about this cheesecake. 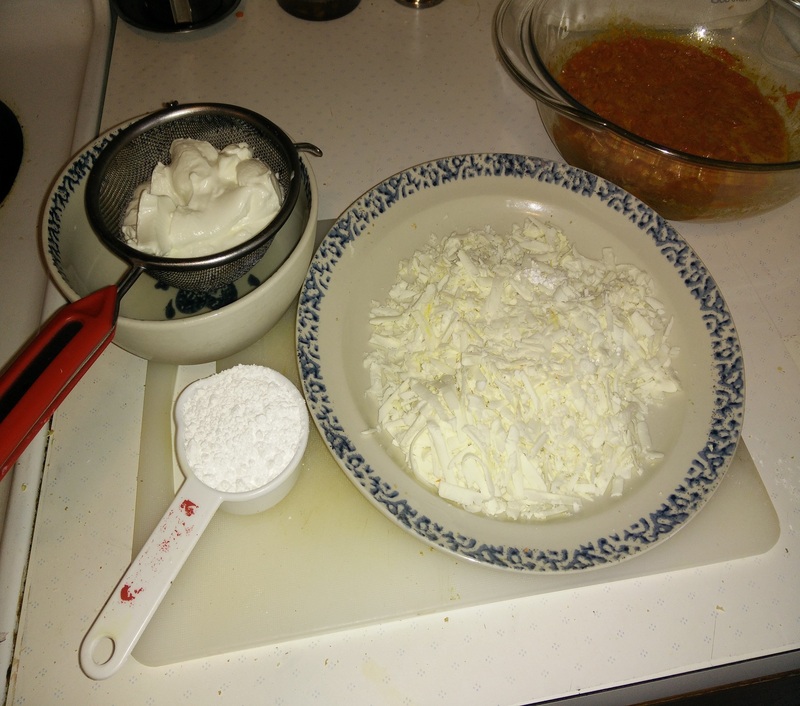 Firstly, here we used mixture of cottage cheese (paneer) and hung yogurt (chakka) as a substitute for cream-cheese which is generally used in cheesecakes. Cottage cheese and hung yogurt when blended together gives creamy, smooth texture and slightly sour taste which is perfect for cheesecakes. Secondly, it is no bake and perfect for summer time. Thirdly, I didn’t use any gelatin or agar-agar here and it worked well. Gelatin or Agar-Agar is used to firm or hold up the creamy cheese mixture in no-bake versions. But omitting it gave a soft cheesecake and its fine as long as it is served chilled. So, it is easy to make in Indian households with cottage cheese, yogurt and any halwa of your choice or fruit pulp. You can use any biscuits or cookies to make the crust. You can set it in transparent dessert cups which you can serve directly or in a circular spring form pan which you can demold easily. Coming to healthifying it, I used butter and oil mixture for halwa and crumb crust, and used condensed milk instead of heavy whippng cream to give creaminess in the cheesecake. And this recipe makes one inch thin cheesecake to make a small portion size. So, do not let anything stop you from making this scrumptious dessert. Line a 8X8″ square or circular dish with wax paper or foil . 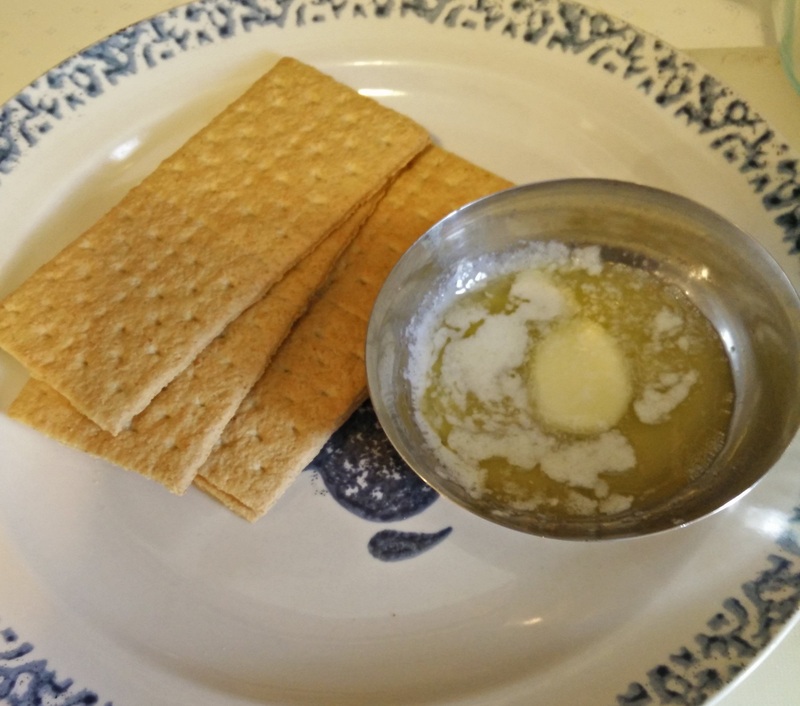 Crush the biscuits or crackers to coarse powder in blender and add oil. The crumb mixture should hold shape when pressed with hand. Add more oil if required. Press the crumb mixture evenly in the dish with any flat base and set it in refrigerator for at least 30 mins. In a microwave safe bowl, add melted butter (or ghee), carrots and microwave on Hi for 2.5 minutes. Add milk, evaporated milk, sugar, cardamom powder and microwave on high for 8-10 minutes and let stand still for 5 minutes. See that most of the milk is evaporated. 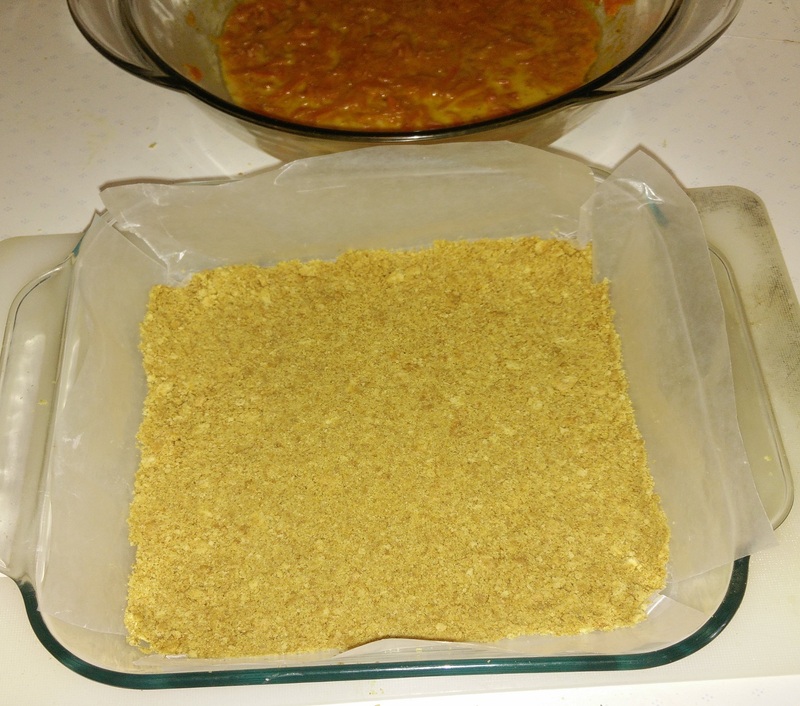 Add prepared carrot halwa and blend again in short pulses to retain grainy texture of carrots. 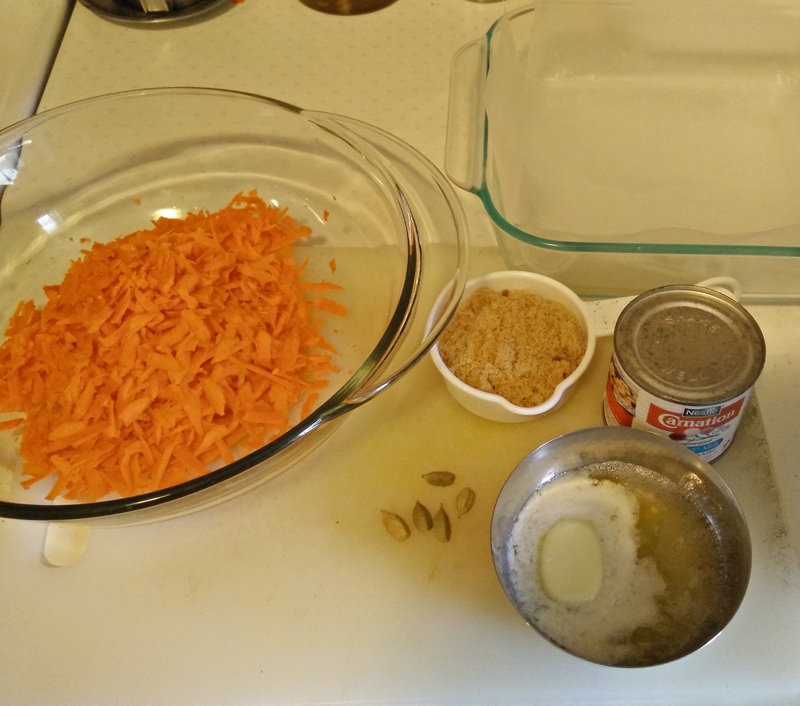 Taste the carrot mixture and add more condensed milk if required. Remove the crust from fridge and pour the mixture on it and set in refrigerator for minimum 6 hours or overnight. Before serving pop it into freezer for 15 minutes. Lift the cheesecake with wax paper or foil and put it on the serving plate. To cut the cheesecake, dip the knife in hot water and use. Serve with chopped pistachios on top. Try and keep the cheese mixture as thick as possible. The consistency of the cheese mixture is like pancake mixture. It may become runny if kept at room temperature. If you want to avoid it or you live in hot temperatures add 1 tbsp of agar agar or gelatin to the mixture.